So succumb to the truly magical feeling of falling in love and you too will simply glow with love, radiate with an aura of romantic energy. So powerful is this inner radiance it feels like an explosion of euphoric vitality which, if it were visible, would appear to those who love as an almighty burst of the color pink. Pink is the color of love and LACOSTE Love of Pink captures that irresistible feeling – a match made in heaven. LOVE OF PINK FRAGRANCE: Love of Pink is the complete expression of femininity and romantic vitality. With a delightful scent which builds on the emotion and character of Touch of Pink, Love of Pink is a girl’s perfect companion towards experiencing the feeling of love. Combining a touch of blood orange and the fresh sparkle of lemon peel, followed by a sensuous, feminine touch of pink magnolia, quince flower and stephanotis, the feminine energy it exudes is prolonged by a refined dry-down of cedarwood. It is finally completed by a dreamy, lingering kiss of vanilla, making it a captivating elixir of love. Top notes: The fragrance opens with a playful burst of blood orange and passion fruit which, underlined by a touch of lemon peel, together create a fruity and zesty first impression. At the heart of the fragrance lies a delicate floral combination of pink magnolia, quince flower, stephanotis, exuding tender intensity and femininity. Base notes: White cedarwood and musky notes form the base of the fragrance and a final surprise – the rich lingering scent of a drop of vanilla – reminds of the feeling of love in all its sweetness. 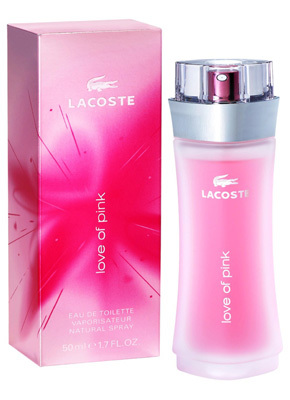 LOVE OF PINK BOTTLE: LACOSTE Love of Pink immediately captures the eye by reflecting the romantic vitality of falling in love. By using the same overall shape as Touch of Pink and reminiscent of the radiant, curvy silhouette of glowing feminine charm, LACOSTE Love of Pink comes in a slender flacon of frosted glass with tapered sides that narrow gently to a waistline. Made of sparkling silver metallic, the outer pack features a burst of the color pink on the center, which gracefully spreads to the sides, visually representing the burst of excitement that comes with falling in love.